Mode of Action | PROTECT Technologies Inc. 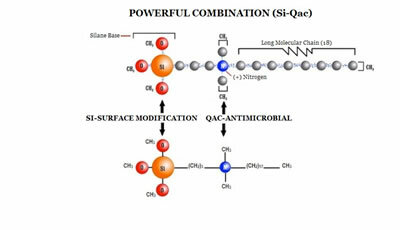 The technical active ingredient is a conventional quaternary ammonium salt (organo) which is chemically spliced to a silane molecule, resulting in a highly active molecule (3-trimethoxsilylpro­pyldimethyloctadecyl ammonium chloride) that has both tenacious bonding capabilities as well as excellent antimicrobial properties. During the application process stable bonds between OH- sites on the AEGIS molecule and the positive charge on the nitrogen atoms (N+) form. The result of this chemical process is the creation of a large co-polymer chemically bonding AEGIS to the target substrate. Positively Charged Nitrogen – The positively charged atom of nitrogen attracts negatively charged microbes which are “electrocuted”. Long Molecular Carbon Chain – The long molecular chain or “spike” that comes into contact with offending microbes. This carbon “spike” acts like a sword that punctures the cell membranes of all microbes coming in contact with it. This “physical kill” terminates the life of the microbe! Think of AEGIS as a microscopic sword and a treated surface acting like bed of nails or swords. AEGIS modifies treated surfaces creating an inhospitable environment for microbes including bacteria, fungus and mold – in other words microbes cannot live on surfaces protected by AEGIS. The positive nitrogen center of the AEGIS sword attracts microbes to it and the long carbon chain punctures the cell membrane destroying the microbe on contact! This combination of stabbing and electrocution allows the technology to be fully effective as long as the surface remains intact. To get a better idea of how Protect Technologies uses the Aegis Microbe Shield to control and prevent the growth of microbes, watch this video: http://www.youtube.com/watch?v=ayWoqb0zbLU.